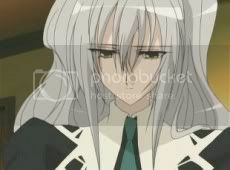 A dash of angst and humour each in this episode of Strawberry Panic! 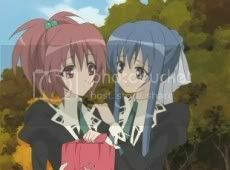 Autumn in Strawberry Panic! world as the leaves on the maple trees were turning yellow and slowly painting the roads in gold. Autumn also meant that the day of the Etoile Election is fast approaching, the students from three schools were very excited about it wondering who will be representing their respective schools. Scene switched to fan girls squealing as Amane walked past and the Evil Lesbians™ looked on from the second floor looking a bit pissed haha. Back to Tamao who was walking along the forest and suddenly realizing that the autumn wind was this cold. Zooming back to the last scene where Nagisa’s leaning against Rokujou’s back, sobbing. Rokujou apologized to Nagisa for burdening her with her hopes of Shizuma regaining to her old self and forgetting that girl. Rokujou apologized again for burdening this impossible task on Nagisa. Nagisa sobbed even harder. The scene was heard by Tamao who was listening behind the closed door. The next morning, Nagisa actually woke up early =O, probably even earlier than Tamao and was hollering out through the window about what a beautiful day it was and time to study hard. [Holy crap did some space alien just swapped the real Nagisa?! LoL] Tamao looked on, still looking worried for Nagisa. Chiyo, Kagome, Kizuna, Lemon and Tsubomi were walking out of the Ichigo-sha gate when Nagisa suddenly sprinted past them, greeting them along the way and Tamao was like ‘Wait for me, Nagisa-chan~.’ Chiyo commented that Nagisa Onee-sama’s seemed to be full of vigor this morning. Tsubomi joked that if you take away Nagisa Onee-sama’s vigor, she would be left with nothing. LOL [I actually burst out laughing when I heard that haha, how true but mean of Tsubomi haha] The Lulim girls were laughing at Tsubomi’s joke but Kagome wasn’t as she looked a little concerned. Shizuma’s in her greenhouse watering her plants ... well not really as she was stoned at the spraying position for quite a moment hahaha. Unlike the time she was happily water her plants and making silly grins and smirks. Another shock! Nagisa’s actually paying attention in class!! She was even nodding and scribbling notes on her notepad. It’s twelve noon and lunch time, over at St Spica, Yaya asked Hikari to go to the cafeteria. Hikari apologized saying that she made a promise, Yaya repeated, ‘A promise?’. Hikari didn’t say anything else and left the classroom. The girls in the class were saying about something between Hikari and Amane, Yaya overheard them and left looking not too happy about it. Standing below the ‘Love Tree’, Shizuma’s doing her angst thingy again. Nagisa and Tamao were walking through the golden-filled forest. Walking backwards with her front facing Tamao, Nagisa said she’s hungry and suggested that they eat their lunches then and there lol. Tamao replied that it’s Nagisa who suggested before that because it was a beautiful day so they had to find a beautiful place to eat in. Nagisa looked a little disappointed lol. Tamao said that after walking through this forest … *gasp* Tamao continued in this anxious voice that they eat their lunch by the lake instead and pushed Nagisa away from the path through the forest. Tamao had noticed Shizuma walking towards them and probably for Nagisa’s sake, tried to avoid Shizuma for now. Shizuma saw the scene but didn’t show much expression about it. Meanwhile, the person Hikari had made a promise to meet up was indeed Amane =) leaving Yaya alone to feed the pigeons at the rooftop. Shizuma went to Kaori’s room and stayed there for the whole afternoon. During dinner, Nagisa was uncharacteristic in her way-too-happy mode, Chiyo noticed that Nagisa didn’t manage to finish her food but Nagisa simply brushed it off saying she had enough. Both Kagome and Tamao were looking concerned for Nagisa. After dinner, the girls were sitting around chatting, Kizuna told the others that Shizuma had been acting strangely these days. Lemon added that she heard from others that Shizuma didn’t attend classes too. As the girls were wondering what happened to Shizuma, Chiyo noticed Nagisa staring blankly away and asked her what’s the matter. Nagisa snapped back and said eh, oh yes, is it time for dinner yet? [LOL She’s going senile] The girls laughed at the ‘joke’ except Kagome and Tamao. 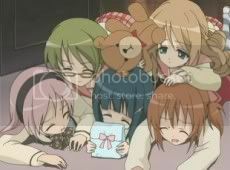 It’s bedtime, the girls returned to their rooms, as Tamao was about to open the door to their room, Nagisa said that she forgot something and ran back. 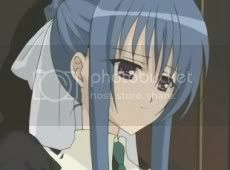 Tamao looked at the retreating figure of Nagisa and seemed worried for her. Nagisa had gone to the music room where she and Shizuma first played the piano together in episode 6. Staring at the piano keys, Nagisa flashed back to the time they last played together in episode 17. 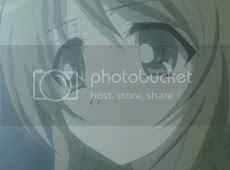 Clutching her hands, Nagisa flashed back to the time in episode 18, biting her bottom lips, she flashbacked to Shizuma’s smiling face at her. As tears threatened to flow down Nagisa’s face, a voice of concern interrupted her thoughts. Surprisingly, it’s Kagome with Ashibaru standing at the side. Nagisa puts up her happy mask again but Kagome wasn’t convinced. Nagisa walked over to Kagome’s side and asked her what’s the matter. Kagome asked ... ‘Why? ...’ A long pause. ‘Why are you crying?’ Nagisa was stunned for a moment before she replied that she wasn’t and ... the tears suddenly flow down Nagisa’s cheeks before she knew it. Clutching her uniform, Nagisa tried to force down the tears but failed and began to wipe her tears while trying to cover it up. 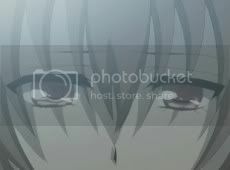 Kagome added, ‘You were crying all the time is it not?’ Unable to hold on anymore, Nagisa sank on her knees, covering her face and started sobbing hard. [Nagisa probably didn’t want to let anyone worry about her and even covered her face so that no one could see her cry] Kagome did the unexpected as she used Ashibaru’s puny paws to comfort Nagisa lol. Tamao arrived and also tried to comfort Nagisa by hugging her. The rest of the girls were worried about Nagisa as they gathered outside Nagisa and Tamao’s room. Chiyo asked if there was anything they could do to help. Tamao replied that it’s better to leave Nagisa alone for a while tonight as we see Nagisa continued sobbing in her bed. The next morning, the girls were walking out of the Ichigo-sha to school but Nagisa seemed to be sick as she didn’t attend class. Chiyo, Kagome, Kizuna, Tamao and Tsubomi were all worried about Nagisa that they were half-hearted in whatever they were doing. At St Spica, Student Council room, our Evil Lesbians™ were reminding Shion about the approaching date for the Etoile Election, when Momomi asked what’s St Spica going to do this year, Shion just kept quiet. Kaname smirked and said that Shion only need to choose an Etoile from St Spica is it not, even so Shion still fixed on her decision to get Amane to participate in the Etoile Election hm? Shion asked what’s the meaning of that. Kaname told Shion to consider properly as they had to get someone everyone agreed on to participate. After saying that, both of them turned to leave. Shion thought to herself, how could they just choose anyone just like that, that person had to be on par with Etoile [Shizuma]. ‘I’ll never give up’, Shion swore. [Oooh bitchy haha] At the St Lulim side, Kagome, Kizuna and Lemon told Chikaru about Nagisa and they wondered what they could do to make Nagisa happy again. Meanwhile, Nagisa’s standing by the lakeside, holding the key pendent in her hands and staring at it before she pulled it back to throw it in the lake. However, the trembling Nagisa didn’t managed to throw it as she sighed, grasped the key pendent close to her chest and fell on knees. Later, the juniors were having a meeting at the Ichigo-sha gate, the St Lulim girls told Chiyo and Tsubomi to make something nice to eat for Nagisa. Flashback to Chikaru thinking hard and suggesting to her juniors to cheer Nagisa up by making some nice for her to eat. Tsubomi was like ‘Such an innocent idea ... if even Nagisa likes to eat but ...’ Chiyo interrupted and said that if they were to sate Nagisa’s appetite, she will return to her old happy self. The girls then agreed in union that if it’s Nagisa Onee-sama … the idea might just work lol. The girls then discussed what they should make, something sweet? Cake? Strawberry tarts? Seasonal cakes? Kagome murmured, roasted chestnut ... Tsubomi clapped her hands together and suggested chestnut cupcake then =) and everyone seemed to be in favour of it. Back in Nagisa and Tamao’s room, Tamao returned from her talk with Rokujou and found Nagisa sitting on the edge of her bed. 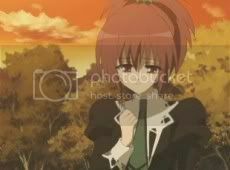 Nagisa told Tamao that ... it ... it would be good if she had not entered St Miator. Tamao looked stunned for a moment. Nagisa continued that if she had not entered St Miator, she wouldn’t had met Shizuma and wouldn’t had to experience this kind of feeling. [Love? Pain?] Tamao cut in and told Nagisa not to say that. Nagisa was a little surprised probably it’s the first time she saw Tamao this agitated. 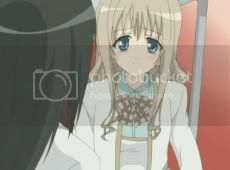 Tamao calmed down, sat beside Nagisa and told Nagisa to listen to her story about a certain girl. ‘A certain girl?’, Nagisa asked. Tamao continued that it’s about a first grade student living in Ichigo-sha, that girl don’t know why she wasn’t roomed with anyone. ‘One day, someone will be your room mate.’, she was told, but the other girl still had not arrived. That girl kept waiting for the other girl’s arrival, the later days would be very happy but the other girl never came. [I’m thinking that the girl Tamao’s waiting was Kaori but due to Kaori’s weak health, she wasn’t roomed with Tamao. I’m pretty sure about it lol, however it’s kinda ironic that Tamao’s supposed room mate to be Kaori and Nagisa to be the one to fill that position two years later.] 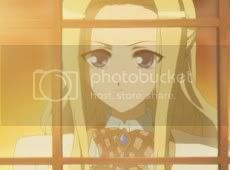 Three years later, Tamao added brightly that a girl transferred to St Miator and she was being roomed with her, and so, the transferred girl arrived. Tamao then flashbacked to the time Nagisa had fainted and was lying on bed with Tamao looking down at her happily. 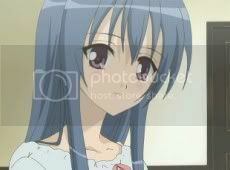 Tamao continued that after the transfer girl came, everyday was very happy and even more than she expected. Further more, the transfer girl was always smiling and filled with happiness, people around were drawn to her energy and smile. Nagisa was touched by Tamao’s words. Tamao blushed, turned and thanked Nagisa. Tamao added that she’s really glad Nagisa came to St Miator so please don’t say that it would be good if Nagisa had not entered St Miator. Nagisa seemed emotionless about it. Tamao added again that even if Nagisa could not make her most important person smile, but Nagisa’s smile had spread to everyone around here. Nagisa still seemed reluctant about it. Tamao urged Nagisa to cheer up, as it’s everyone’s desire. ‘Everyone?’, Nagisa repeated. Covering her hand over Nagisa’s, Tamao said that everyone likes Nagisa, stood up, opened the door and lol the juniors came tumbling out through the door. Nagisa’s surprised that everyone’s there. Tamao confirmed to Nagisa that everyone’s concern about her. The juniors, one by one supported Nagisa by telling her to cheer up soon. Chiyo then presented the cookies they made to Nagisa, Lemon added that if Nagisa’s appetite’s sated, Tsubomi continued that then Nagisa’s vigor will return back! Finally cheering up and touched, Nagisa apologized for worrying them and suggested that they have a tea party =). Not much Shizuma, just some scenes of her in angst about her memories of Kaori and stuff. This episode is more of Nagisa and Tamao, Tamao kinda confessed to Nagisa but too bad Nagisa’s sleeping but you’ll never know, Nagisa might be awake? LoL. A surprisingly development for Kagome-chan, never knew she’s such a observant person aha. Oh, I love the scene where Kagome just broke Nagisa’s barrier just like that, it’s getting way too freaky for Nagisa to be that happy after episode 19 lol. Ok, I mentioned this before about Tamao’s supposed room mate, so I was reckoning it to be Kaori, because she’s the only person to be in St Miator yet not in St Miator at the same time lol besides this will get even more interesting if Nagisa knew about it. It’s like Tamao vs Shizuma all over again if Kaori were to be roomed with Tamao right in the beginning. Ohh the irony. Anyways, it’s not unexpected to know Nagisa’s really popular with the juniors ... and from the spoilers in the tagboard, thanks to Dorazz, the popular Tamao seemed to be participating the Etoile Election with the equally popular Nagisa =O. How will Shizuma react? Well gotta wait till episode 23? Haha. Oh yes, almost forgot, the tension over at the St Spica’s side’s building up again, although Hikari and Yaya made up after the incident at the end of episode 13 and in episode 14, Hikari still bore the emotional scars of the aggressive Yaya, will Yaya tear under the stress again? Anyways, anyone noticed that after that incident, Hikari seemed to be bolder in approaching Amane. Like in episode 15, the Carmen play episode, Hikari offered to help Amane in the scripts and in episode 16, after the play, they were casually chatting with each other. In episode 17, Hikari seemed to be seriously waiting for Amane while Yaya just stormed off leaving her alone. Is Hikari trying to approach Amane in hopes of dashing Yaya’s advances? How cruel … it’s just my theory, might not be true haha. Go Tsubomi x Yaya =D. Oh, the preview looks exciting, the conversation between Nagisa and Tamao ... sounds disturbing to a Nagisa x Shizuma supporter [Flashback to my dream of a Nagisa x Tamao ending ... ahhh nooooo~] and a pissed off Shizuma looks hot heh. Oh yeah, do you guys know that the Strawberry Panic! Novel Volume 2 is out? I'll do a write up on it tomorrow about the beautiful cover and coloured posters inside XD. Oh, I can't read Japanese though argh, haha. 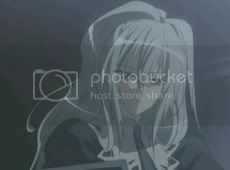 Meanwhile Strawberry Panic! Manga Volume 2 will be out on 27th September 2006 wheee. This episode isn't bad at all as a lot of surprise from Nagisa. 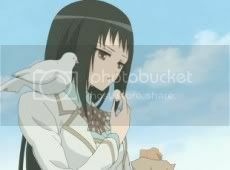 Yaya with pigeons around her... quite dreamy in my opinion as we usually see angst Yaya. Again Kagome in action! Damn she is cute and adorable!!! The way she use Ashibaru to pats Nagisa head, so cute!!! XD. Kagome is just the special character you need in the anime. 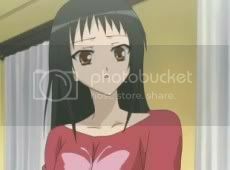 I also reckon that the girl who was suppose to be Tamao's roommate in the past is Kaori. As it shows that only Tamao and Kaori are living alone by themselves.
" it’s not unexpected to know Nagisa’s really popular with the juniors ... "
" Oh, the preview looks exciting, the conversation between Nagisa and Tamao ... sounds disturbing to a Nagisa x Shizuma supporter [Flashback to my dream of a Nagisa x Tamao ending ... ahhh nooooo~] and a pissed off Shizuma looks hot heh. " Well the preview shows a angry Shizuma ! that i got to see with my oen eyes!! Actually jeffng9, I disagree with you point when you said about Amane and Shizuma might plan something fishy. I'm sure these two won't. I think Shizuma might tell Amane the true meaning of Etoile battle(perhaps proving your love to your lover)and what's it's like being Etoile and to work with your love ones too. And Amane suddenly realize Etoile battle is not just a position. 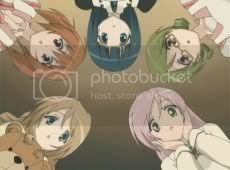 In the end Amane determine to join in with Hikari. Overall the episode was a disappointment. I wanna know if Tamao really kiss Nagisa. And to know if Nagisa know. Shizuma !! snap out of ur past and face the future ... NAGISA !!! quit being so wishy washy, !!!!!! Ok this will be a much disturbing image for the Shizuma supporters! Yey let's celebrate Tamao-Supporters! Our dreams is finnaly coming true!!! They said that this pic is in one of the episodes. I'm not sure how they got this, but I think it's true. Look what Nagisa and Tamao wore! 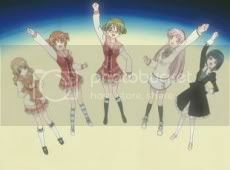 That's the exact thing that Mai Nakahara and Ai Shimizu wore at their first ending credits the "Himitsu Dolls"! I think the first ending was already a clue that Nagisa and Tamao will really end up together! To Latina: The picture, its not really from one of the episodes. The art is just a little bit different (even though the hair was really well done :3), and if you look at the hand its a little bit out of place, even the outlines are softer. So its not by one of the sutopani artists. Hmmmm... I really hope Nagisa was half awake or something when Tamao kissed/hugged/confessed, even though I doubt she was. And now that I know that Tamao wasnt just randomly happy when Nagisa came, it makes me love her more. I'm a Nagisa and Shizuma supporter. I'm sure Nagisa will be with Shizuma. They are meant to be together XD. All I can say is that Tamao has not come to a resolution. Here's their picture too..hmm it might be depressing for Tamao supporters. It's more like the Tamao fans shouldn't provoke us Nagisa/Shizuma supporters! There's already more of them in number so leave us alone but that doesn't mean we will be let down easily! Shizuma will be with Nagisa. Shizuma&Nagisa 4ever! So this episode has awaken Tamao's fans hope huh? I think the confession wasn't a confession at all. More like fans service to me. I'm a Shizuma fan but honestly Tamao's confession is very genuine, expressing forth her feelings inside and not just for fun like the above poster said. Heh! We did not provoke any Shizuma supporters! You can't just bash us for the things we didnt do! We are just supporting Tamao. Besides you call Nagisa x Shizuma = Love????? Shizuma doesnt even love Nagisa for crying out loud!! She did not even gave any reaction when she saw Tamao and Nagisa together. She even stayed at Kaori's room all the time! Thats just plaiiinnnn stuuuupid! If she truly loves Nagisa THEN LET HER PROVE IT!!! She's even doing anything!!! Just kept whining and longing for Kaori. Relax relax, haha, no flaming please. >>>>So this episode has awaken Tamao's fans hope huh? I think the confession wasn't a confession at all. More like fans service to me. I disagree, before this episode, 'Confession', Tamao fans have always had hope lol. 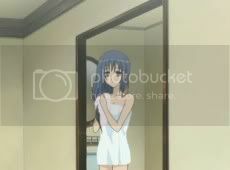 The confession of Tamao IS a confession not fanservice, however it doesn't start when Tamao confessed to Nagisa that she likes her but from the scene where Tamao told Nagisa about the story of a lonely girl without a room mate and the appearance of the transfer student. I think it's really poetic of Tamao. 'Tamao then flashbacked to the time Nagisa had fainted and was lying on bed with Tamao looking down at her happily. 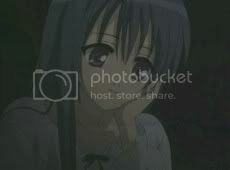 Tamao continued that after the transfer girl came, everyday was very happy and even more than she expected. Tamao's really supportive of Nagisa, makes her feel useful and important. If you listened to the Drama CD, in Track 8, 'Tamao's Confession', Tamao roughly confessed about Nagisa's influence on her with her smile, genki-ness and stuff. Confession doesn't start and end at the 'I like you' sentence. It's the flow of the feelings and the heart-felt words, not just focusing on the 3 words. >>>>>I'm a Shizuma fan but honestly Tamao's confession is very genuine, expressing forth her feelings inside and not just for fun like the above poster said. Now I think Shizuma felt a sense of gulit in her, like she's betraying Kaori but trying to forget her. Or so she realized, she couldn't love a person. Hopes Shizuma make another attempt to show Nagisa she loves her in later episodes =). Or the other way round, Nagisa could make the first step haha. I reckon the tension between Shizuma supporters and Tamao supporters are high ... but please respect each other. Thanks. I can see in many places, everyone have "text-war". This episode really cool as it does have impact on the audience. I love the plot writer! But one thing I can't forgive them is that, the plot has been progressing slowly. Well a matter of disagree or not its alright as dorazz spoiler was rather bold and straight, Stating that Amane had a change of mind after a little chat with Shizuma. As for my previous comments about me having a bad feeling about it, its because i'm looking at the second scene or situation which is why i say that i have a bad feeling about it. As Shizuma might not be able to think of another way of stopping so she might plan to make Amane enter the Etoile battle for her sake of stopping Nagisa & Tamao. I'm sure you guys know what happen when you became ruthless after hearing a certain news that might make you not to be able to think positively, so there is a chance of that happening... thats all i want to point out in this post. I think Shizuma is positive how she feels for her but her "whats love" issue is the case to me... in previous episode just like Miyuki state that Shizuma's iceberg heart is welcoming spring which also means that Shizuma is trying to know what is "love" again. To further support my statement more, in episode 12 Shizuma did say that Nagisa might be her last after they finish bathing in Shizuma's room, this is a prove that Shizuma does have a little feelings for Nagisa.
" But one thing I can't forgive them is that, the plot has been progressing slowly. " I think it's natural for Tamao fans to starts the war because the spoilers does give that hope. I still believe there's no way Nagisa would love Tamao. She adore Shizuma more. Many support on this. And anyway, I love reading those wars between fans in the anime. It was fun. To jeffng9, I like the idea of what you proposed as the "second scene". It can be true guys :D I worship your deep thoughts. I'm a true supporter of Shizuma Nagisa. I got a little gabby when I typed this comment. I'm sorry if I mention stuff that's already been discussed to death and say some "duh" things or off-base things, but I'm taking this chance to talk about a show I've come to like. Apologies! I look at Tamao/Nagisa/Shizuma and Yaya/Hikari/Amane, and I appreciate how Tamao is dealing with Nagisa's unavoidable fate to play a significant role in Shizuma's life. I'm blissfully ignorant of big future ep spoilers so my comments here may be uninformed. The expectation and all the development is on Nagisa x Shizuma. Maybe Nagisa is there only to repair Shizuma and not necessarily *be* with her, but it won't be unexpected if that's what winds up happening. Anyway. Tamao might be a tad jealous and selfish and maybe even a bitty bit manipulative, but she doesn't let it create a wall between her and Nagisa--she's never done nor will do any harm to Nagisa. I'm glad she's there to provide a hand to help Nagisa pull herself back up, along with the help of the 1st-year gang of course XD . Ultimately, without knowing what's going on in the manga or anything else... I can't commit to saying whom I prefer out of Nagisa x Tomo / Shizuma. I don't think either one would be short-changed no matter which way it went. It'll be interesting to see what impact Shizuma's next move makes on Nagisa (esp. after reading jeffng9's hypotheses), but regardless, at the end of the story, I can't see "Tamao being left out in the cold." Even despite Shizuma's "she's mine" flare-ups. Oh, about the first-year gang, I always have a good-natured smirk whenever Kagome's around because her and Oshibaru (sp?) are always around the Lilium nutcases ^^ and that usually spells madcap hijinks. This time, I'm glad she got another chance to be her own character and strip Nagisa's facade for her own good. Is Kagome observant, empathic, or did she hear whispered concern from Oshibaru? Either way, point to Kagome. Ack, back to the Tamao / Yaya comparison. Now, of course, Hikari x Amane really doesn't have any complications like Nagisa x Shizuma have beyond Yaya's own possessiveness. Yaya is not like Tamao at all--if she had, we wouldn't have such a diverse cast, but then again she wouldn't have hurt Hikari >_< . I knew that the "scar" was still there on Hikari--I was just waiting for the show to remind us of it. It's irreparable, and I wish Yaya could find something to distract her from Hikari. It's almost to the point where I'm uncomfortable in my own chair when those two are on-screen at the same time--I know it's going to be walk-on-eggshell time. Sorry for not shutting up sooner, and thanks again to akayuki. Welcome eldebo =), nah it's okay hm, lol yes I agree, Kagome pawned episode 20 ... can't wait for episode 21 for more Shizuma angst heh. And you're welcome, hope to see ya around. You are the man eldebo!! Well, if anyone saw ep 21, they would know all these scheming is nonsense. Shizuma is definitely speaking from her heart and more importantly Shizuma has no idea that Tamao and Nagisa are going to be chosen so what's there to plan? now u can speak as loud as u want about its a nonsense after you watch it~ you don't have to tell us that as everyone who watch it knows about it !LoL! Ay.. Maybe the nonsense bit was kind of harsh. I would be quite sad if Shizuma stooped this low to win Nagisa's heart thus my reactions. No worries ok? :) I'm a Shizuma x Nagisa fan too. There's no point of waiting for Nagisa and Shizuma's storyline. Now its obvious Tamao and Nagisa's storyline and where do they go from here. Eps 23 will be the start of the high light, SP Fanz !! buckle up for the wait and SHIZUMA x NAGISA ALWAYS !!!!! !